Purina One has just recently introduced a new SmartBlend line of cat and dog food. With this new line they have a new bag look. 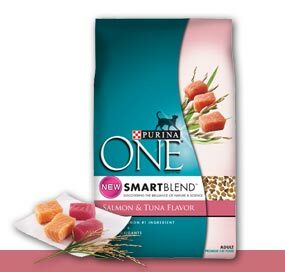 Purina One SmartBlend also has an improved taste, increased levels of antioxidants, and they also promise that chicken or salmon is the #1 ingredient. How would YOU rate Purina Smartblend w/beef and rice? We just got a little 3 year old Schnauzer and picked up some food on the way home. Reading all those labels is confusing so I just got some Purina One Smartblend Small Bites Beef & Rice Formula. Well the dog seems to like it just fine, ate it right up. Now I'm checking it out on line and I've been reading some really terrible things about this food, mostly the lamb formula. Has anyone had experience with this, it appears to be comparable with Iam's which we used for our lost dog several years ago. Any suggestions? I live in a very small town and don't have access to many brands. Join in and write your own page! It's easy to do. How? Simply click here to return to Dog Food Promotions.